Instagram is incredibly valuable for businesses and marketers, especially since users are so excited to engage with brands on-platform. More than 80% of users follow at least one brand, and more than 120 million users as of 2017 had gotten in touch with a business through a CTA button on the business’s profile. 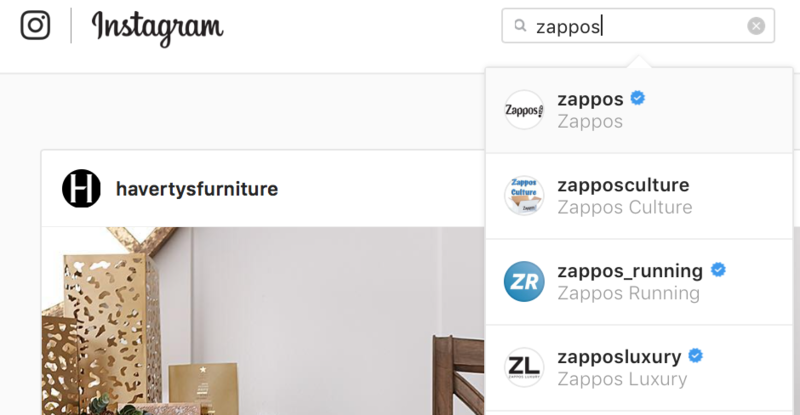 Instagram users are regularly discovering new brands and new products on-platform, and they’re making purchases, too. If you want to see those results, of course, then you need to be doing everything in your power to engage in Instagram best practices. Plenty of brands are able to get the basics down: slap on a few hashtags (ideally, between 8-11), share some great pictures, and include some Stories into the mix. Where many start to let things slide, however, is the details. And with the devil being in the details, as they say, this can cost you. One of those details is their profile picture. This is one thing that most people don’t give a lot of thought to, even though they should. 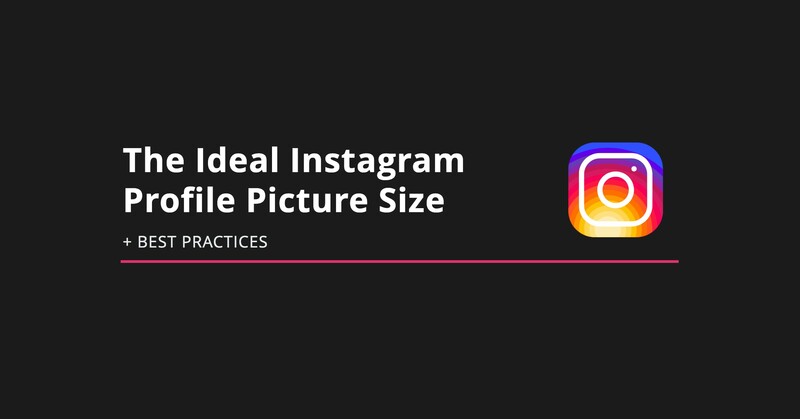 In this post we’re going to discuss why it’s so important, and we’ll also look at ideal Instagram profile picture size and the best practices you need to be using. Wondering what the ideal Instagram profile picture size is? We can answer that for you! 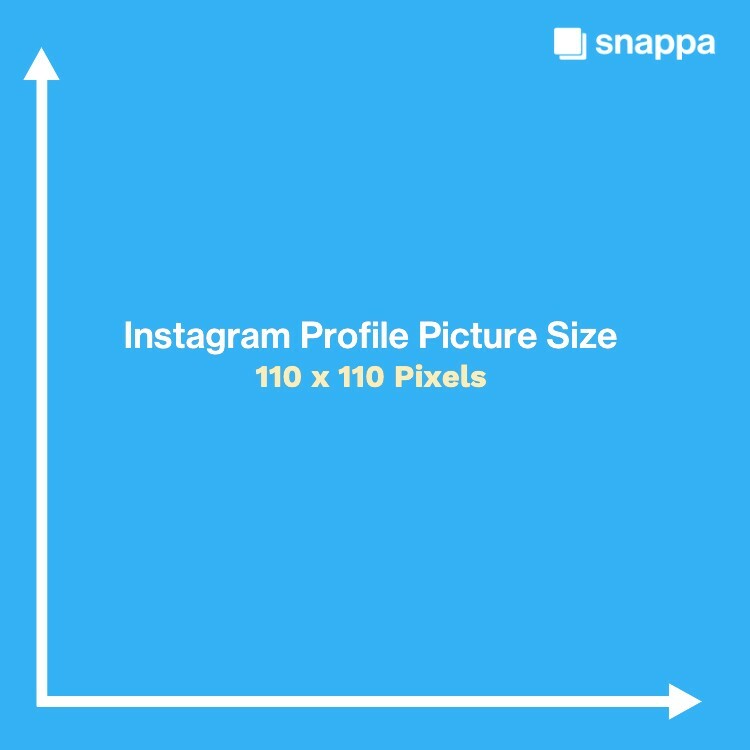 Your Instagram profile picture size should be 110 x 110 pixels. A perfect, tiny square. For your profile picture to have a high quality resolution and not be distorted or resized in a strange way, it’s important to get these measurements exactly right. You can use Snappa to do this quickly and easily, or to make a new profile picture for Instagram all together. 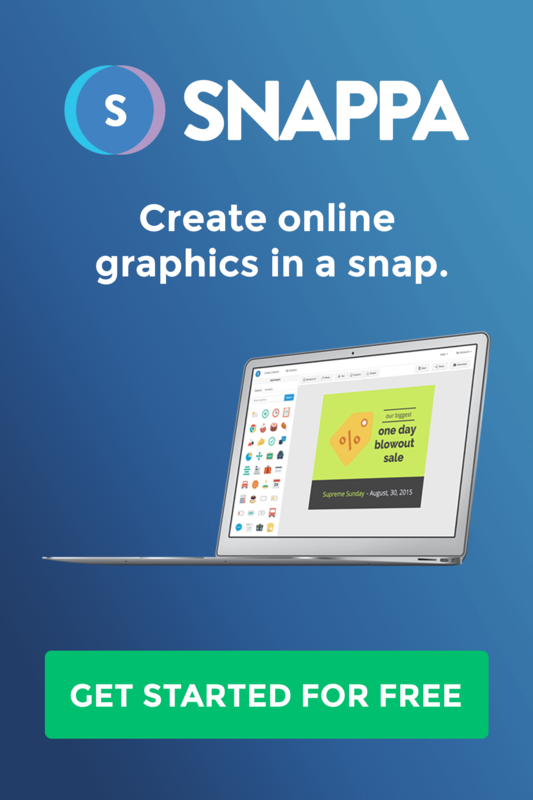 Use “Create Custom Graphic Size” in Snappa’s creation tool, and enter in the 110 x 110. You’ll immediately see a canvas in those perfect Instagram profile picture dimensions. You can upload your business’s logo (which I did here), or even create a new logo with some of our design elements we have in our library. You can use any extra design elements like shapes, text overlay, or effects to make the image more dynamic. Add borders, a single letter, or additional color to help your profile picture stand out. Once you’re ready, all you have to do is download the image and upload it to your profile picture. What Should My Instagram Profile Picture Be? Your Instagram profile picture should be easily recognizable even once it’s a super small circle on a mobile app. In many cases, this this will be a branded logo. 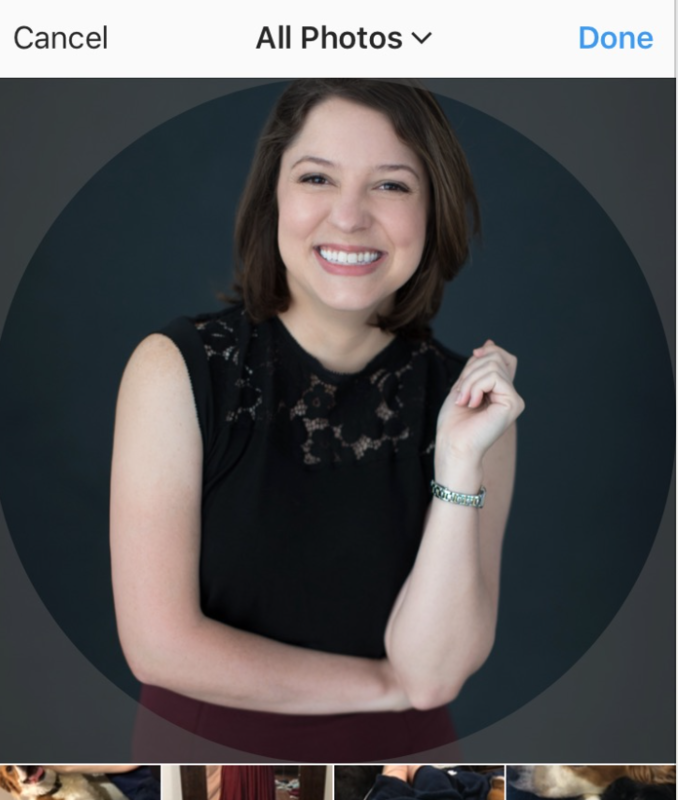 If you’re a business of just a single person (think an author, freelancer, or consultant), then you can use a quality headshot of yourself. Ideally, your Instagram profile picture should be consistent with the profile pictures that you’re using on other social media platforms. It should stay the same instead of being changed regularly, so that people can easily find you and know that you are who you say you are. It should represent who your brand is and what you offer. Simple designs will work best. We say this a lot on Snappa, but use lots of white space and don’t create an image that feels too cluttered. This is so important especially for Instagram profile pictures, where the image is so small even on desktop. If you try to do too much, even a chunk of text will be unrecognizable on those small screens. Use color contrast to help the design stand out. All of the examples we’ve featured in this post so far have done this. Have a simple background (no stock photo backgrounds on this one), and make sure that the text or logo is starkly contrasted against it. This will increase visibility and make it easier for people to make out the design. Keep cropping in mind. Instagram wants you to upload a 110 x 110 image, but that’s going to be cut down to a tiny circle. What looks great as a perfectly square image but not be a great fit in a more circular form. Be conscious of the when creating the picture, and remember that the corners are all going to be rounded out. Plan for that when you’re designing your profile picture. Does My Instagram Profile Picture Really Matter? Your Instagram profile picture can seem so physically small, but it does matter for several key reasons. The first is that it can add immense credibility to your account. You want people who see your profile picture to have no doubt that your business is a legitimate operation. It’s also important for brand recognition. You want people to see that picture and know exactly who you are. You also want it to represent your business well. It’s kind of like the McDonald’s logo; everyone knows what it looks like. When I was younger, all it took was seeing that logo and I’d have the taste of oh-so-salty french fries in my mouth (though to be fair, that may have been whatever addictive additives they put into that stuff). And there’s still one final reason: a strong Instagram profile picture will get you more Story views, especially when your Story might appear in the Discover section. If users are interested by what they see, they’re more likely to watch, and if they watch, you’ve officially connected with new customers. Your Instagram profile picture is such a small thing, but it holds so much importance. It needs to represent your business well, be easily recognizable, and stand out enough to immediately capture user attention. When I’m searching for a business on Instagram, I will actually look at the profile pictures as one of the most important signals as to whether or not I’ve found the profile I’m looking for. If I see a low quality picture that’s hard to make out, I’m going to skip over it. Remember that you don’t need to be changing up your Instagram profile picture regularly, and that you shouldn’t. Your entire feed is full of beautiful, dynamic, visual content that you can upload as you see fit. When people click on your profile, they’ll immediately see that engaging feed and get whatever they’re looking for there. You can also customize your bio to alert customers of sales or special events, or Instagram stories and Instagram story highlights to feature any content you want to ensure new users see. Use additional features to offer dynamic content to your followers, and let your Instagram profile picture be your rock. Ready to give your Instagram profile picture a remodel? 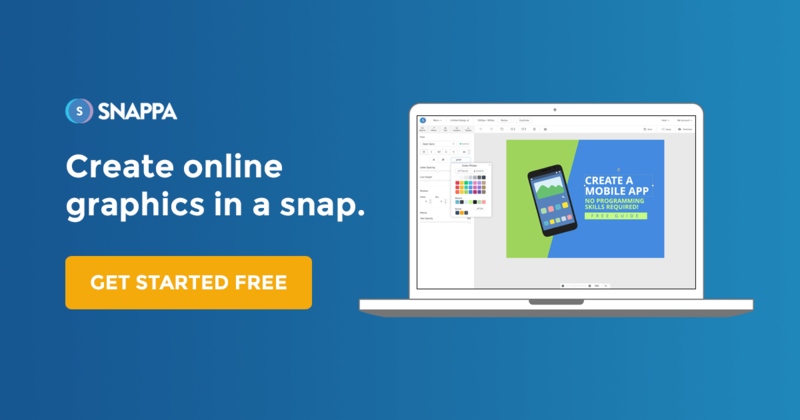 Start your free trial with Snappa today.